LifeLight is an apparatus and method system for monitoring road surface temperature to detect hazardous road surface conditions. An indicator provides the sensed road surface temperature and hazardous road condition warning to a driver while a tail light interface automatically produce a tail light signal to warn drivers traveling behind the vehicle when a hazardous condition is detected. In an embodiment, the system includes a vehicle engine retardation system interfaced with the hazardous road condition warning system. When the retardation system is in use and hazardous road surface conditions are detected the controller automatically produces the brake light signal unless a tail light control switch is used to manually deactivating the automatic tail light flashing signal when the vehicle is traveling in a state that does not allow alternative control of the brake lights. - LifeLight has never been purchased or sold. I invented, patented, and have sole ownership of the product. 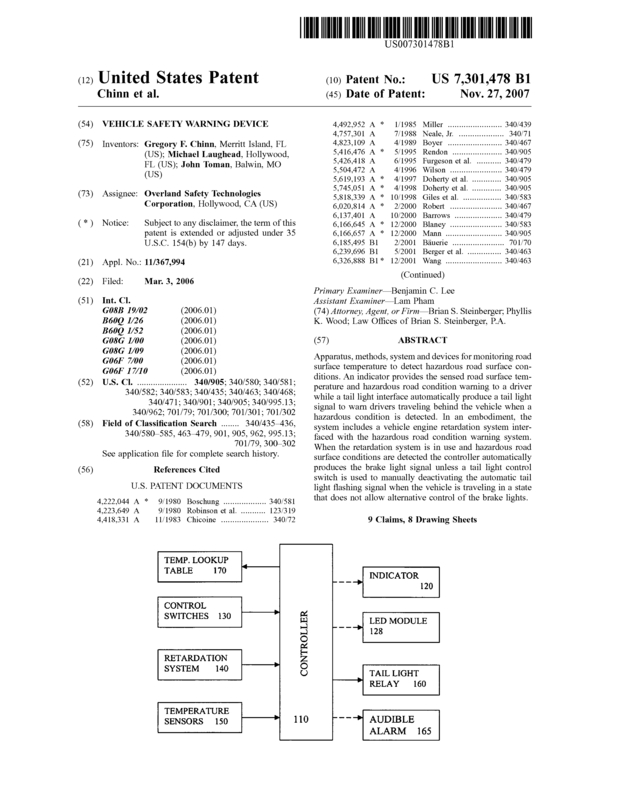 Page created at 2019-04-25 18:20:45, Patent Auction Time.